Download this Daddy Dearest card to your computer and print on white or blue card stock for Happy Father's Day. This is a nice Father's Day card for kids to hand print a message inside and address to Dad. 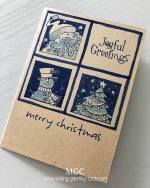 As you can see from the images provided here, this is a very simple greeting card. 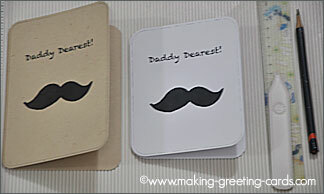 All that you see on the front of the card is a big bushy moustache and the words 'Daddy Dearest!' on top of the black moustache. 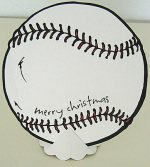 I have also use a brush to create a frame with rounder corners for this card for Dad. No Happy Father's Day words - just Daddy Dearest! So it can be for any occasion. A Just Because card, Thinking of You card or even as a Happy Birthday to Dad card. Anyway, use it to write a heartfelt message to Dad on his special day or just any day. I have created 2 files and provided each in a separate pdf document for you. One is a A2 card size and the other a A6 card size. I actually prefer the A6 size because the design has more space below for a more pleasing look. But if you only have envelopes for A2 size, it's okay. I'm sure either one would be a pleasant surprise to Dad for this Father's Day celebration. You should have the latest copy of Adobe Reader to read and print this file. If you don't have Adobe Reader, please go here to download a free copy. Insert a sheet of A4 or Letter size card stock into your printer. I used 220gsm weight paper. You can choose between 200gsm to 250gsm paper weight for a good sturdy card. The image is in portrait layout so you do not need to rotate it at all. Best to score the fold line first. Lightly draw the cut line with a pencil. Cut and remove the pencil lines with a eraser. Fold on score line and crease. 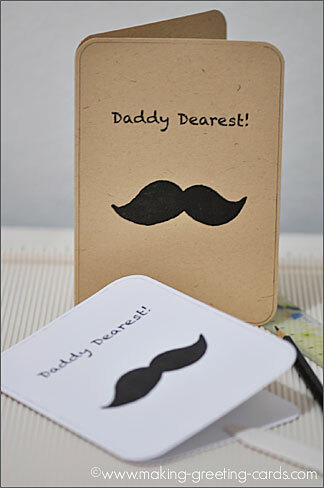 Add a card insert and write your message to Dad. 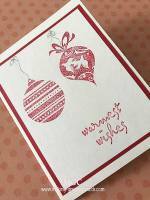 I made two samples for this article - one on white cardstock and the other on a lightly speckled and textured light brown card. I think I prefer the light brown one better. One is it's taller (A6) and so have more negative spaces. Two, it doesn't look too contrasting and in fact have a warmer feel because of the speckled and texture. I think just a smooth beige colour card might work too. 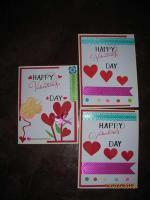 Making Greeting Cards! 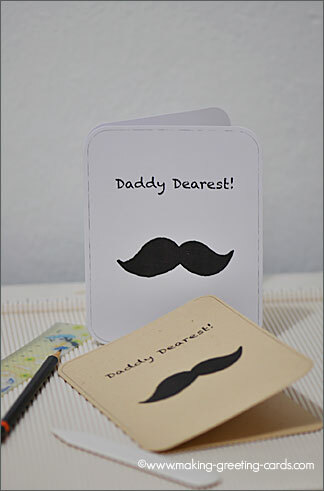 › Father's Day Cards › Daddy Dearest!